Héctor Bellerín – The 10 year right back? After you read the title of this article, please take this with a pinch of salt and look at it hypothetically. So as it stands, Mathieu Debuchy our current second choice right back, was only brought in last season for a fee believed to be 12 million pounds. Injuries derailed his season and in a weird way, brought us up a level in the rise of the young Spanish flyer, Héctor Bellerín. To say the teenager at the time, could oust a French internationally experienced defender, injuries aside, is the stuff of dreams. 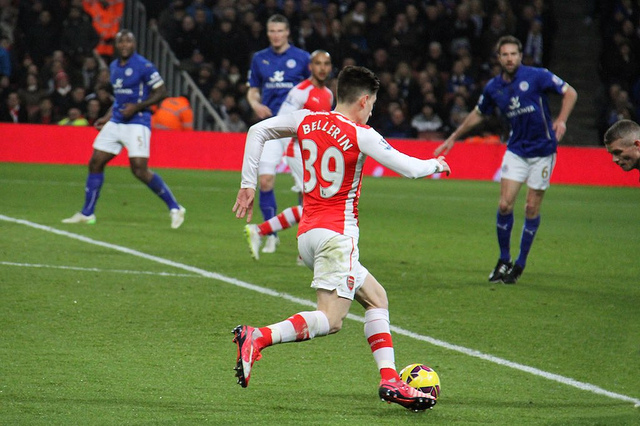 Picked ahead of the Frenchman this season, Bellerín again has come on in leaps and bounds. While his astonishing pace is a massive part of his overlapping and recovery game, he has proven on many occasion he can read the game defensively, make clean standing tackles and is a true goal threat as well. Even in to his early 20’s his impact at Arsenal, and on defences in general, cannot be overlooked. While names like Cazorla, Özil and Sánchez will more often than not take over the opposing managers thoughts, it’s fair to say Bellerín has to be seriously thought about also. Pace like his is a weapon few possess. If you can’t be sure just how much an impact pace has in modern football, just look at his recovery for the certain Bafétimbi Gomis goal he stopped a few weeks back. Power and pace is the way forward in most sports, and not many athletes in any ball sport in the world can match Bellerín stride for stride. A young man who it’s reported can run the one hundred meters in a fraction under 10 seconds, on the break with the ball at his feet, is not only incredibly terrifying to any defender on the planet, but is also an amazing sight to see. His ball control at such high speed is jaw dropping. The worry for Arsenal fans is, knowing that he is a La Masia academy graduate, and being Spanish, the appeal of returning home and playing for his boyhood club, is something we have already been through once. Yet he himself said “playing for Barcelona isn’t the be all and end all of football” and while it’s true a footballer’s loyalty these days isn’t worth a cold cup of coffee, you get the feeling with Héctor, we could be looking at Arsenal’s right back for the next decade. Of course Dani Alves isn’t going to be there forever, and the Catalan clubs eyes are likely already on their former youth product, the hope is any offer would be turned down. Considering we are in a position to win things now, and how well he has taken to life in London, maybe a move back to Spain is something we can prevent for as long as possible. But with a player so young, so good at his age, their will be plenty more suitors than just the Basque club. It seems the only way is up for Bellerín at Arsenal, and his improvement isn’t over yet. The boy who was scouted by Arsenal as a winger, has turned in to one of the finest full backs in England and it’s only a matter of time before he wins his first international cap, which will really put him on the map. It’s a shame that Debuchy never had a real chance, but to be ruthless, what came of that is for the better of Arsenal going forward. And if Debuchy does leave, Carl Jenkinson is a very capable back up next season or sooner if needed. With Hector Bellerín on the right side of our defence, flying by defenders, Arsenal’s right hand side is going to be as dangerous as any team’s in the world for years to come, and with Jenkinson coming back too we should be well stocked on the right side of defence. Héctor Bellerín has come a long way from the boy who had a horrible night at the Signal Iduna Park last season, since then, the rise has been as rapid as his running speed. The boy who broke Theo Walcott’s long standing sprint record has become a young man on and off the pitch very quickly. Humble, respectful and dedicated, a long career as Arsenal’s first choice right back is his for as long as he wants it. This entry was posted in NewsNow, The Bergy Blog and tagged AFC, Arsenal, Arsene Wenger, Defence, Premier League, Walcott. Bookmark the permalink.